Baladin today. 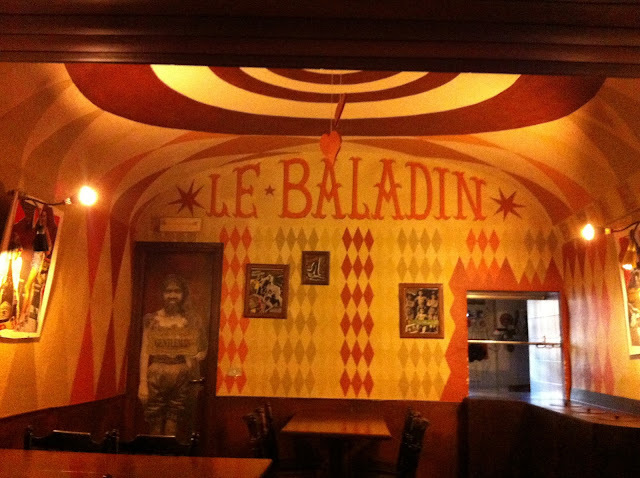 If you've heard of Italian beer at all, you may have heard of Baladin. The man heading the show is Teo Musso and, imagine in your mind the charisma of Sam Calagione, the pioneering stature of Ken Grossman, and throw in a huge dash of creative ferment, and that's Musso. Teo entered the beer biz in his native Piozzo (less than a thousand souls) back in 1986 when he opened a pub with 200 types of beer (bottles, largely). This is pretty remarkable--even now, beer is a very niche thing. Yet there, in the remote (but spectacularly beautiful) corner of Piedmont, the townsfolk of Piozzo were drinking some of the world's finest beers. Over time, Musso began talking to Belgian brewers about starting his own venture, and with some converted dairy equipment, he launched his brewery in 1996. But it was more than a brewery. 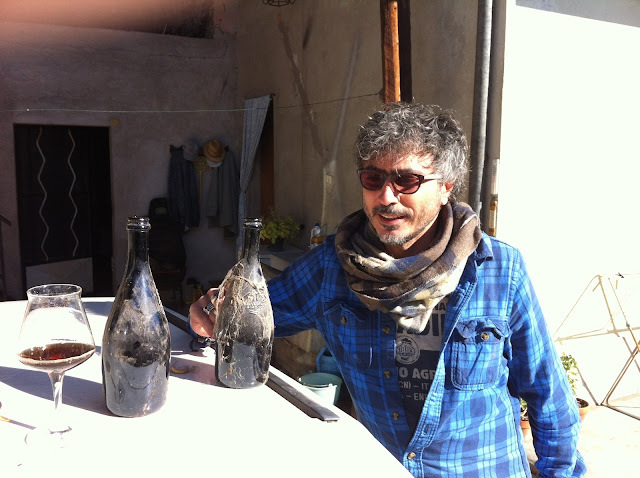 It was an integrated expression of Teo's vision: he designed the distinctive fonts and artwork and even the unique bottles--from the start (now Italy easily leads the world in cool bottle shapes). He had the vision of a circus, more medieval Italian than creepy clowns, and that's how the original pub is decorated. The used to have a tent over a courtyard to the side of the building, but as they expanded and grew, they had to put in a permanent roof--but Musso designed it to look like a tent. His most amazing project is just under way: agriculture. Musso bought over 200 acres of land for grains (mostly, but not exclusively, barley) and two separate fields for hops. Ten American varieties at one site, and Mittelfruh and Hersbrucker in the other. They are definitely the first hops in the country, and if grain production and malting happen in Italy, none of the brewers I've talked to use local malt. When I left, Teo offered me any beers I wanted. Suitcases being a confounding limitation, I confined the haul to two, and the one I was most interested in was Nazionale, a 100% Italian-sourced beer. 1. 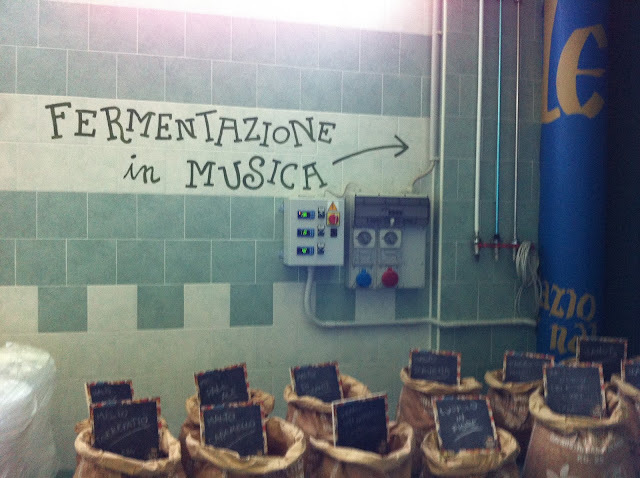 Example of Teo's strange ways: he's experimenting with music and fermentation. Using speakers suctioned to the side of fermenters, he pumps music in, thinking the vibrations will affect yeast activity. It's not a joke, either; he hired a sound engineer and is doing experiments with different kinds of music. 2. 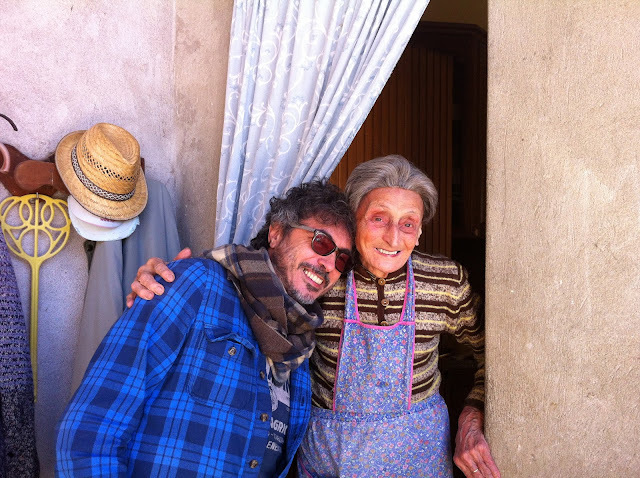 Teo and his Mom--they live just two blocks from the pub and the old, now converted, chicken coop is where Teo does some barrel-aging.